You may have heard the promise of “the best cup of coffee you will ever taste” a lot of times but with the AeroPress® Coffee Maker from Aerobie® this promise may be kept. It is not only me promising you that. A lot of professionals swear that this magic press makes the smoothest, richest, purest and fastest cup of coffee in the world. So let’s have a closer look if the AeroPress deserves all the chorus of praise. At first I would like to make clear that the word AeroPress is in contrary to the French Press a registered trademark. With this saying only Aerobie’s AeroPress is the real deal! The AeroPress consists of 4 components which are the plunger, the seal, the chamber and the filter cap. You also get a filter holder + 350 Micro-Filters, a scoop, a stirrer and a funnel. All materials used in the AeroPress are FDA-approved and BPA free! While the preparation is quite entertaining, the design is pretty basic. All parts of the AeroPress except the seal are made of polypropylene which provides a higher durability. The rubber seal is made of a thermoplastic elastomer. Both materials are FDA approved and BPA-free. The units of 1 to 4 are applied in a yellow color and are easy to read. However, the disadvantage of the polypropylene is that it’s less transparent so the dark brown chamber makes it difficult to see the level of grounds or water you have added. Aerobie states that additional durability is more important than transparency. I agree with Aerobie, but you may have a different opinion. The AeroPress is an entirely new way to make coffee. Now you pour one scoop of fine ground coffee in the chamber and make sure it’s evenly spread at the bottom. The next step is to add 175°F hot water to Level 2 on the chamber. You may ask why 175°F and not the recommended 195-205°F. According to Aerobie, they focused on the testers taste. While they were saying that at the usually recommended 200°F the coffee was good, all of them preferred the brew at 165°F to 175°F. If you don’t have a thermometer on hand, simply bring the water to a boil and wait for about two minutes. The water should now be close to 175°F. After adding the water, stir the mix with the included stirrer for about 10 seconds. At last insert the plunger and press carefully for about 20 to 60 seconds. The result is a smooth, rich flavored coffee that most likely reminds you of a good Espresso. Some have even mentioned it makes a better Espresso than many home machines. A big advantage is that you can create different coffee drinks like Cappuccino, Latte or just regular American Coffee. For the AeroPress, you should use a fine grind of coffee, preferably grinded at home right before brewing. The type of grinder you have is not so important, so even the less popular blade grinders work fine. But you have to make sure the coffee grounds are fine enough. How do you know that? When it has the texture of cornmeal or as Aerobie recommends, when it sticks in the grinder because of the static. The AeroPress requires a special Micro-Filter. 350 of them are included in the package. If you need more, Amazon has the original Aerobie pack of 350 most of the times in stock. If you consider yourself environmentally conscious you could also invest in a permanent filter specifically made for the AeroPress. The complete immersion of the coffee in the chamber guarantees that all grounds are uniformly in contact with the water at the same temperature. This ensures a perfect extraction because no grounds are in contact with too high or low temperatures as it can happen in drip coffee machines. Air pressure shortens the filtering time which can reduce or even eliminate the bitterness of a long brew cycle. The lower temperature and shorter brewing cycle results in a much lower acid level. Too much acid is usually the reason for an upset stomach. But do all these tests and statements live up to their promises? Reviews from the big guys like Newsweek, LA Times or Wired.com all rated the AeroPress with Five Stars. From coffee connoisseurs to professional cuppers all praised the outcome of the AeroPress coffee and the rich flavor. Cleaning of the AeroPress is totally painless. The air pressure not only works with the coffee it also cleans the chamber. After you removed the cap you push the plunger to eject the coffee “puck” and discard it. Rinse the end of the plunger with water and the cleaning process is finished. You should clean the AeroPress BEFORE you enjoy your coffee to keep the seal free of compression for a long life. 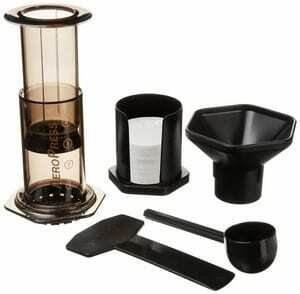 The revolutionary AeroPress by Aerobie makes extraordinary coffee similar to espresso! 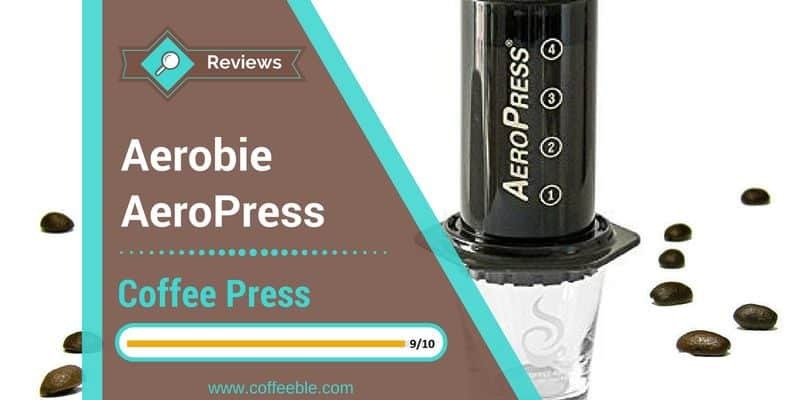 If you want to have full control over the coffee results and be able to enjoy some Lattes or Cappuccinos as well, the AeroPress from Aerobie is the perfect coffee maker for you.